BSE Electronic, one of Europe’s top providers of global high-tech manufacturing services, chose XJTAG as its preferred boundary scan system for efficient screening of complex boards prior to in-circuit and functional testing. Since being installed, the system has helped drive test coverage well beyond the company’s initial expectations. To ensure consistently high product quality and reliability, BSE applies a number of test techniques including optical inspection of each electronic assembly, prior to in-circuit test and functional testing using custom-built test stations. XJTAG provides unique features that allow engineers to use on-board devices such as A-to-D converters to capture responses from components that cannot be tested using traditional boundary scan systems. Custom tests can be written using XJTAG’s high-level language, XJEase, to control individual devices. XJTAG also includes code to manipulate industry-standard interconnects such as an I2C or SPI bus. This allows the system to communicate with a wide variety of analogue and mixed-signal components, as well as JTAG or non-JTAG digital devices. The second-generation XJTAG XTR-series boundary scan system, which was introduced in January 2010, further extends XJTAG’s capabilities to include direct measurement of up to 18 analogue voltages allowing multiple supply rails to be sampled before or during testing. The new system is also able to measure clock frequencies within 10 ppm accuracy up to 200 MHz, and supports multiple boundary scan chains. Making use of XJTAG’s extensive test capabilities has allowed BSE’s engineers to screen assembled boards more rigorously than was previously possible using optical inspection. According to Patrick Guerinel, future projects will achieve even greater test coverage. “By applying best design practice, with help from XJTAG’s built-in DFT analysis, we will be able to test most parts of a system using boundary scan. This will enable us to drive productivity still higher, to further increase value for our customers”, he concludes. We chose XJTAG after evaluating a number of alternatives. In practice, it has delivered much greater testing capability than we expected. Simulating bus signals using XJTAG allows us to test the SDRAM and Flash memories connected to the FPGA, even though they are not connected to the boundary scan chain. We can also verify the outputs of adjustable power supplies from within the boundary scan environment, using the A-to-D converter on the board. 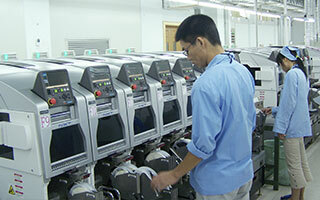 Going forward, XJTAG will help us drive productivity still higher, to further increase value for our customers. BSE Electronic is a provider of global high-tech solutions including R&D, design, test engineering, assembly, integration, logistics and after-sales support. The company provides expertise covering electronic, computing and mechanical subsystems from its headquarters in Le Creusot, France, and has facilities in Tunisia and China.